To experience the most VR has to offer, you're going to need a room-scale play area where you have enough room to move around freely, which helps to heighten the feeling of immersion. "Room-scale VR" basically means that the VR app or game you're using is configured for the size of the play area you have available and takes advantage of that space to provide you with an immersive environment where you can move around, versus just sitting or standing in one place. How Much Space Do I Really Need for Virtual Reality? The amount of space you need for VR depends on what kind of VR experience you are attempting to achieve in your play area. If you're planning on a seated experience only, then you don't need anything beyond the area of your desk chair. If you elect to step up to a standing VR experience, you'll need at least a 1 meter by 1 meter area (3 feet by 3 feet). Ideally, you would want slightly more space than this if you have it. For the highest level of immersion (room-scale), you're going to want a room large enough to safely walk around in. The minimum play area HTC recommends for room-scale with the VIVE VR system is 1.5m by 2m. Again, this is the minimum area. The maximum area recommended is 3m by 3m. If you have space, then go for it, if not, go as big as your room will comfortably allow. Do I Need High Ceilings for VR? The height requirements for HTC's VIVE tracking stations aren't exactly set in stone. They state “Mount the base stations diagonally and above head height, ideally more than 2 meters (6 feet 6 inches)”. Currently, the Oculus Rift VR system doesn't allow for as large of a room-scale type experience as the one is offered by the HTC VIVE. They don't appear to have any mounting requirements with regards to the height of their base stations. They seem to expect that they will be at roughly the same height as your computer’s monitor and they assume that you will have one located directly on either side of it (although some users have recommended they be mounted higher). If you don't want to permanently mount your tracking stations/sensors or you want to test various heights/locations before you place them permanently, buy a couple of camera tripods, or light stands and experiment with various heights, then mount the stations/sensors later on after you've dialed in the best height and location. Make sure your space is safe and free of obstacles and other things that might affect tracking. When you're immersed in the VR world, you’re blind to your real-world surroundings. Both HTC and Oculus offer a system for warning you when you're approaching the boundaries of your play area, but they assume that you have already cleared the area of any tripping hazards or other obstacles that might get in the way. Make sure that your play area is completely clear of anything that might get in your way and cause an injury. Low ceiling fans can be a real problem when people are flailing their arms and such in VR. Consider removing them and replacing them with a non-glass light fixture. If you must have a fan, consider a low profile one on a stand, maybe in the corner of the room outside of the play area boundaries. A well-placed fan can actually add to the immersion depending on what kind of game you're playing. When setting up the virtual boundaries of your play-space, don't set them at the very edge of the space, set your boundaries slightly smaller so that you'll have a safety buffer. 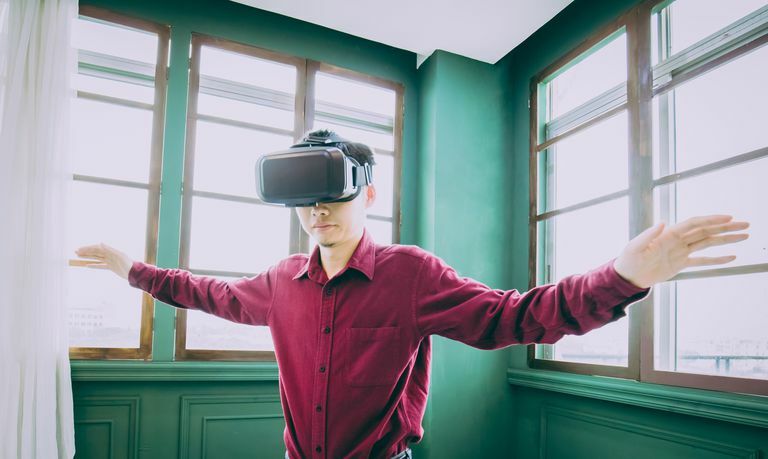 Whatever room you end up using for VR, you're going to want to ensure that you've got a solid network connection running to it. Ideally, for multiplayer gaming in VR, a wired Ethernet connection would probably be the best option. If you don't have Ethernet wiring available, consider using a Powerline networking solution which uses your home’s electrical wiring to carry network signals. Ensure that at the very least, you have a strong Wi-Fi signal available. Mirrors and windows have the potential to interfere with the motion tracking of your VR HMD and/or controllers. If these items aren't movable, consider covering them with fabric or something so that they don't reflect light generated by the motion tracking devices. Determining if a mirror or other reflective surface negatively affect your tracking is a trial and error process. If you notice a lot of tracking problems, look around for something reflective that might be causing the issue. The second most important aspect of properly cabling your VR room is ensuring that the cables which connect your PC to your VR HMD are as unobtrusive as possible. Nothing breaks VR immersion quicker than tripping on an HMD cable. This is why some people have created elaborate ceiling-mounted cable management systems while others move the computer into a closet or another room entirely. It's completely up to you what level of cable management you want to achieve, just make sure that it's safe. Wireless cord replacement options are already being sold and may get rid of the cable-tripping problem altogether in the near future. What Kind of Flooring Should I Use in My VR Room? When planning a VR room, flooring is extremely important for several reasons. The first reason: safety. In VR, there are plenty of opportunities for exercise. Some games require crawling, jumping, running in place, shooting, and all kinds of other maneuvers. You'll want to have a comfortable surface to perform these actions. Carpet with a thick pad underneath would be a great start. Interlocking foam tiles might be even better. Ideally, creating a warning track, like those used in baseball stadiums to tell an outfielder he's about to hit a wall, would also be useful in VR (for basically the same reason). Using foam padded tiles in the play-space, but not taking those tiles all the way to the edge of the room, would provide for a subtle tactile cue to the person in VR, letting them know, by the change in floor textures, that they are at the edge of their safe area. This subtle cue helps to not break the immersion but gives the user a warning that they should turn around and go the opposite direction or at least proceed with caution. VR is obviously a very personal and solitary experience, but that doesn't mean it can't be a social experience as well. In fact, there are many multiplayer VR games where one person can play using the headset and other people can either assist them by using a controller or mouse while watching the action on a second monitor. This effectively turns the whole experience into a party game. Even if a game doesn't offer a co-op mode, most games will mirror the VR headset’s output to a second monitor so spectators can see what the person in VR is seeing. If you have some extra space in your VR room and you want to maximize its usefulness, consider creating a VR spectator area where people can watch on a big screen TV or monitor and make the whole experience into a more social one. To create a VR spectator area, you need to create some kind of a safe physical barrier between your play area and your spectator area. If you have a large horizontal room. Take a couch and move it to the far end of the room, face it toward the wall and then put a monitor or TV on the wall. This way the VR user won't run into the TV (because they are blocked by the couch). This also gives the spectators a safe place to watch the VR action and/or participate in co-op play. If you're going to have a dedicated room for VR then you might as well give it some creature comforts and convenience features as well. Some VR games might make use of real-world props such as gun stocks for virtual sniper rifles, golf club shafts, driving wheels, etc. You might want to display these on a wall in a manner where they look good but are easily removed for use when needed. You might also consider mounting something to hold your controllers, headphones, etc, and maybe add or build a controller stand that features integrated charging as well. Bottom line: Make your VR room functional and safe for both those in VR and those spectating.